Each July millions of cycling fans head to France to experience the world's greatest bike race or dream of the day they'll make the trip. Unless they've planned carefully, they'll arrive to find full hotels, blocked routes, overpriced food, chaotic roads, and endless frustration as they try to get close to the race they've come to see. Now Graham Watson's Tour de France Travel Guide lets cycling fans experience all the excitement of the Tour while negotiating its many daily obstacles with the confidence of a local. As cycling's leading photographer, Graham Watson has been in the right place at the right time during every stage of every Tour de France since 1977. No one knows how to get around the Tour like Graham. Graham Watson's Tour de France Travel Guide will be available in late May in bookstores, bike shops, and online. The book is shipping now from VeloGear.com. Working media should request review copies immediately. Graham's guide is the first book of its kind, and it's the only resource cycling fans need to experience the Tour to its fullest. Learn where to eat, where to sleep, how to get around, how to see and photograph the race, and how to enjoy the greatest show on two wheels. Graham shares his 31 years of Tour de France experience in this beautifully illustrated guidebook. Featuring over 200 of his award-winning photographs along with full-color maps, travel tips, checklists, and travel resources, this book presents a fresh and unique strategy for getting around the Tour's many opportunities for frustration to find a front-row seat for all the action. Presented in sturdy, flexible binding with flaps for marking pages, Graham's guide also includes a clever menu decoder for quick reference when the waiter is tapping his pad, tips on how to meet the riders, a glossary of French cycling terms, historical perspective on each region of France visited by the Tour, and a special chapter on how to photograph the Tour like a pro. For the Tour's legion of fans, Graham Watson's Tour de France Travel Guide contains everything they need to watch, follow, and enjoy the Tour de France in style. 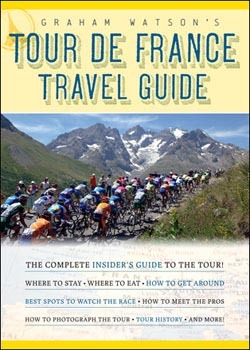 Graham Watson's Tour de France Travel Guide: The Complete Insider's Guide to the Tour! Flexibound paperback with flaps. Full-color photos, maps, charts, and tables throughout. Since 1903 the Tour de France has visited over 500 towns and villages. Watson has followed every stage of 31 Tours de France, a pedigree few can match. A completely modern guide, annotated with websites and the latest contact information for hotels, restaurants, trains, car rental, bike rental, camping, tourist information, and more. Lavish 4-color interior, handy size, and flexible binding with flaps make this travel guide inviting, durable, and easy to use. VeloPress is an endurance sports and fitness publisher with training and history books on cycling, triathlon, and running. VeloPress is the book publishing division of Competitor Group, Inc., publisher of VeloNews, Triathlete, Inside Triathlon, and Competitor magazines and producer of the Rock 'N' Roll marathons, half-marathons, and the Muddy Buddy adventure series.